When creating custom lists and data definitions, you can control not only how the input form appears to your users but also how the list itself displays. Eventually you may realize you need to create another sign-up sheet but you don’t need the same level of detail provided by the Volunteer Sign-Up data definition you created. Liferay empowers you to customize both the input and output of your lists to unlimited levels. Dynamic data lists provide two areas to customize: detail templates and list templates. This covers the forms of lists (detail templates), as well as the display of the list contents (list templates). The default data entry form is the entire data model you created in a data definition, including required and optional fields. Listies who create new lists using a data definition will see every item in that definition on the input form. What if, however, you want a quick sign-up form to find out who’s coming to dinner tonight? Using a detail template you can customize the form’s display any way you want. You can limit the fields displayed for entry or change the order of elements. To access and create new templates, go to Control Panel → Content → Dynamic Data Lists → Manage Data Definitions, choose the data model you want to modify, click the Actions button and choose Manage Templates. When you click on Add Detail Template, you’re presented with the same kind of graphical, drag-and-drop interface used for creating the data definition. Move items around, delete unwanted fields from view and save when ready. Note that data definitions can have multiple templates. You can choose the template you want to use for display in either a dynamic data list display or a dynamic data list form portlet (see below). You should create as many templates as you might need, and you can prototype them in the portlets to see how each feels. Now your friends and enemies alike will be impressed with your list.it skills. It may look to the untrained eye like you’ve single-handedly created three or four different data types for your lists but you know better. You used the power that detail templates provide, using one data model that encompasses the maximum information you might need (like preferred activity, favorite color and ideal schedule). Then you quickly churned out four different detail templates with a few mouse clicks. Now that you have such a vast amount of data collection options, how will you display them? However you want, as you’re about to find out. Just like detail templates, list templates are found in the Manage Templates section of a data definition. With list templates you can customize the display of a list in precisely the same way as you can customize web content. List templates can be written in FreeMarker or Velocity, pulling data from the data definition in the same way that web content templates pull data from their structures. We’ll look at a simple example, but for more information on using template scripts to pull data from a backing structure, see web content templates in chapter 3. 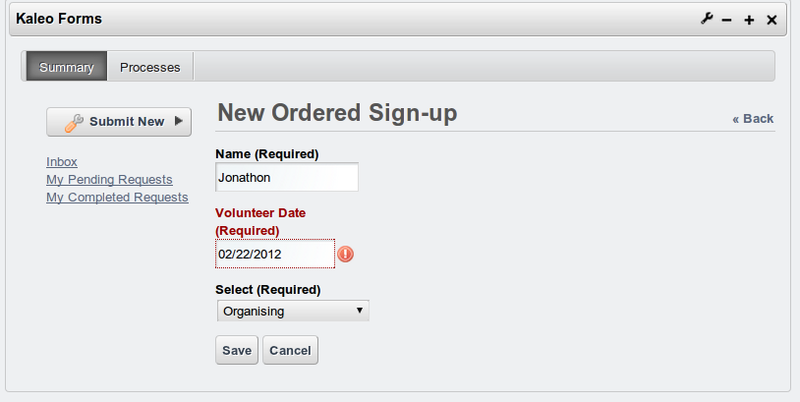 The first thing we need to do is create a new list template for our “Volunteer Sign-Up” data definition. Like other features in Liferay, there are several ways to do this, depending on your context. Navigate to where your DDL Display portlet is and make sure your list is selected. Find the Create List Template icon on the bottom-left of the portlet window and click it to create a new template. If you don’t see the icon, sign in as a user with rights to create templates. Go to Manage → Site Content. When loaded, navigate to Dynamic Data Lists → Manage Data Definitions. Now you can click on Add List Template to create a new template. Navigate to Dynamic Data Lists → Manage Data Definitions. Fill out the form with a title and a description. Next, choose a templating language. Just like web content templates, you can choose between FreeMarker or Velocity. There is no functional difference between the two. Once you choose the script language, you can upload a template file or choose Launch Editor to type in a script manually. Inside the editor you can also choose to use plain text editing or a rich editor that features line numbers and syntax highlighting. Here are the tasks that people have signed up for on "$reserved_record_set_name.data". Once you’ve typed your source into the editor window, click Update and then save the list template. With the list template selected, your list display can now be a summary of tasks as shown below. If you’re not a Listie, and you happen to be deploying custom lists in an environment that requires approval from other users, then it’s not enough to just create the list and display a form. What you need is a real integration with Workflow. Workflow integrates smoothly with Dynamic Data Lists. Liferay integrates the powerful features of workflow and the data capabilities of dynamic data lists in Kaleo Forms. Workflow is not enabled in the dynamic data list portlets by default, so you can focus on the core task of building custom forms backed by a data list. 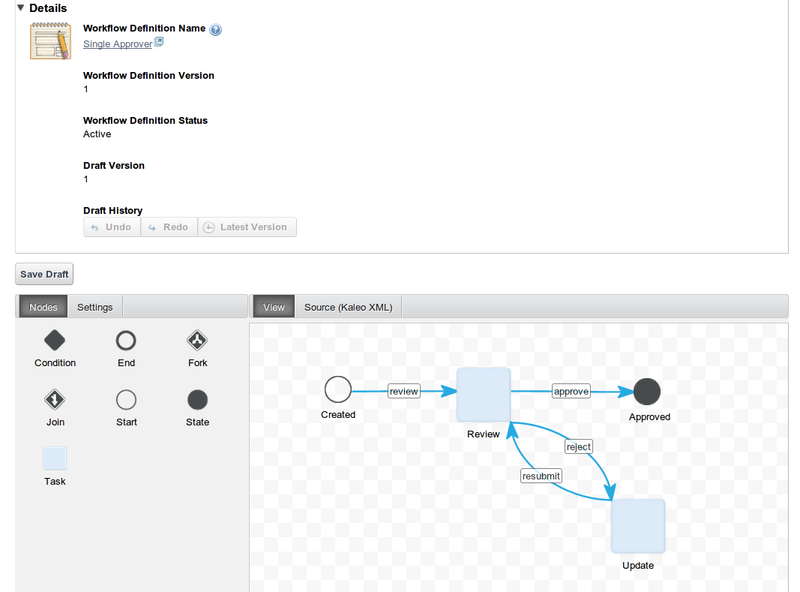 After this is done, you can deploy custom workflows to the form and its data. Though Kaleo Forms is only available in Enterprise Edition, you can still apply a workflow to a list when creating it in the Community Edition. Choose the workflow you would like to use, then every record has to go through the workflow process. Now if you need to preview or edit entries as they’re coming in, it’s easy to work in to your daily workflow. Kaleo Forms is a plugin that enables you to have greater control over the list creation and entry process. For lists to appeal to companies all over the world (and make your new site not just a resounding success but attract profitable businesses), business users must be able to control the workflow of list entry and review those entries when made. There should also be a cool dashboard you can use to make all of your changes. Inside Kaleo Forms, users can create lists that follow a workflow, called a process, or create new entries in a process. Creating a new process is easy, straightforward, and effective. Defining processes that must be followed in data collection and entry is a fundamental part of business. Historically, this hasn’t been fun or easy but Kaleo forms makes it as easy as possible. A process is just another way to describe a workflow you want on a list. When you place a Kaleo Forms portlet on a page, you are presented with a dashboard with two tabs: Summary and Processes. The summary view shows entries you have added to established processes, while also allowing you to add new entries. The processes view allows you to manage process definitions you have created. Within the Kaleo Forms portlet click on the Processes tab. Click on Add Process and a form appears. Enter a name and description, helping your users understand the purpose of this process. Select the appropriate list, workflow and forms you want to use in this process. Click Save to save your process. While the form looks complicated, it can be straightforward. There are a few pieces that make up a process and clicking on each one takes you to the relevant list of options to insert. The first part of a new Kaleo process is also the simplest: the entry definition. This is just another way to refer to a data definition. All of the available data definitions can be chosen, including our awesome “Volunteer Sign-Up List.” Just like with normal data lists, you can always create a new entry definition from the list view by clicking on Add new definition. Create: Create mode gives a display for creating the initial entry. The first stage of any workflow requires you to create a new entry, so this should be the mode chosen for the initial form. All fields marked required must be included on create mode forms. Edit: Edit mode is used for any stage of the workflow process. For instance, you may want to separate information that shouldn’t be saved from information that should. Other stages in the workflow may be a great place to store that additional information. No required fields have to be present on an edit mode form. Once you have chosen the initial display you want, all that’s left to do is configure the workflow for your process. You can now select a workflow to apply to your new list-defined process. All the available workflows can be chosen and you can create new ones from the selection screen. Simply choose Add Workflow and a Workflow Designer screen appears allowing you to define a new workflow by dragging elements in a flow chart. We’ll keep ours simple and just choose “Single Approver Definition.” This gives us a starting point (entry creation) and a ‘review’ task, which we can use to add additional information in a secondary form. Many workflows offer you the option of having multiple editorial and review stages. During these stages, you might want to offer different forms that allow the user to add more information to the entry. Kaleo forms offers you the opportunity to fine-tune the stages of workflow to use different forms. Choose the workflow task by clicking on it. This selects the task in the chart. 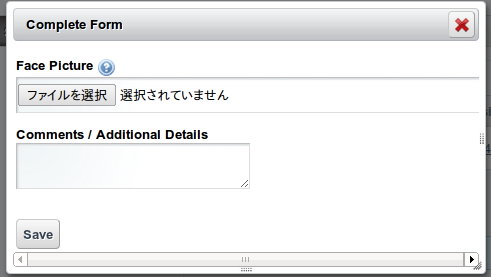 In the details pane on the left-hand side there is a property called Forms. Double click to edit the value. Start typing the name of a detail template and it appears. Click Save to save the form assignment. 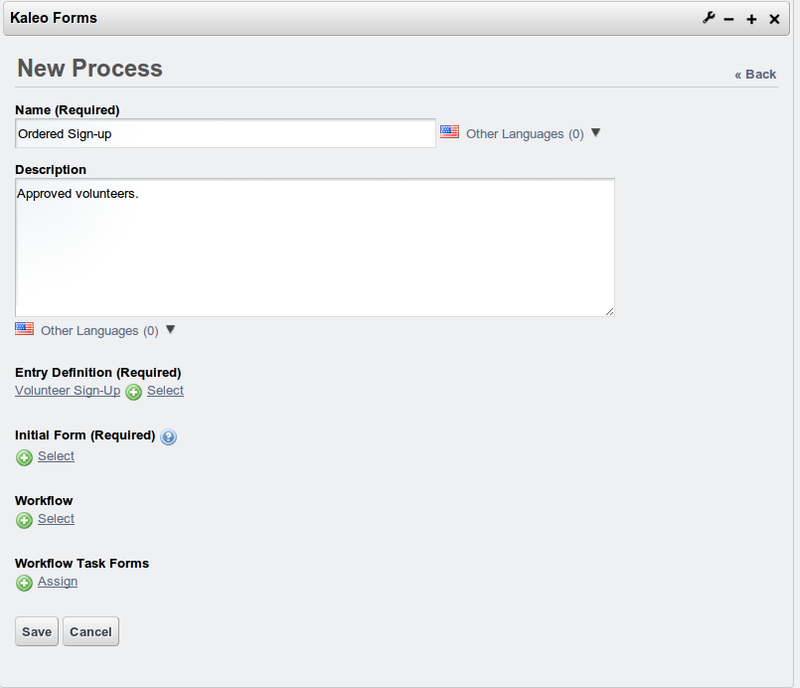 You can assign forms to as many tasks as you need until you’re satisfied with the workflow. After this stage, save the process and it’s ready to be used in Kaleo Forms. Once you have a new Kaleo Form process, you can add new entries through the Summary tab in Kaleo Forms. Once the form is filled out and submitted, it enters the workflow you selected for the process. Next to the entry in progress click the Actions button. After the new entry has worked its way through the entire workflow, it is added to the data set collected. The owner of that data set (who created the Kaleo process) can view and edit the entries collected. If you are a Listie, or a list.it developer, you’re now prepared to show your lists to the world. That is, in fact, the reason you created list.it in the first place, right?